Are we heading into the abyss of moral, spiritual and cultural relativism, in which there is no ultimate right or wrong, no absolutes? Will we become a nation where power, might and influence can forcibly deem the unnatural and taboo... acceptable? Is that where we are going? We are reaching a time when we will have to stand regardless of the personal or political costs. We must appeal to God in heaven for His mercy, and favor over our nation. 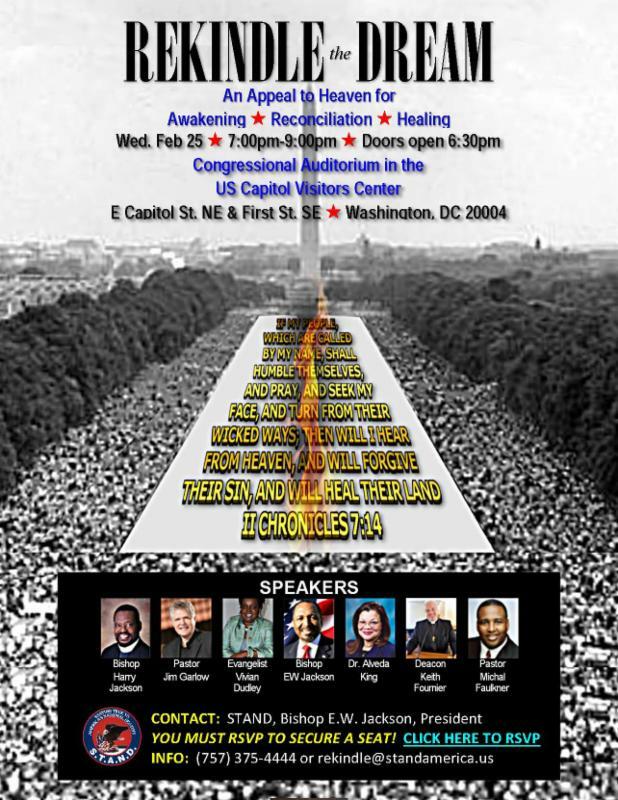 On February 25th, STAND, along with a number of other pastors and spiritual leaders from across the country, have reserved the U.S. Capitol Visitor's Center in the Congressional Auditorium for an event to turn our hearts and nation back to God. Click here or on the flyer to reserve your seat today. This is not a political event, but a spiritual one. This pastor-led event is a time for awakening, reconciliation and healing -- to appeal to heaven and to God Almighty for His favor over our nation. During the Revolutionary War period John Adams recalled that, "pulpits thundered with the cause of freedom." In 2015, America's pulpits need to thunder again with freedom and righteousness. It is imperative that pastors speak into the lives of political leaders with love, but also with prophetic power and authority, and tell them "what sayeth the Lord." There is a Supreme Authority in the universe, and it is not the President, the Supreme Court or the Congress. All of us will ultimately answer to Him. That is what February 25th is all about. This week we will be joined by my good friend and a key speaker at Rekindling the Dream, Ambassador Ken Blackwell. Amb. Blackwell will join us this Tuesday to discuss reasons why our nation needs such an event like Rekindling the Dream. Amb. 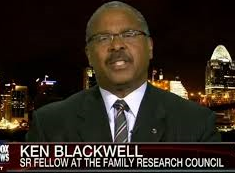 Blackwell is the Senior Fellow for Family Empowerment at the Family Research Council and has served as Mayor of Cincinnati, Treasurer and Secretary of State for Ohio, Undersecretary at the U.S. Department of Housing and Urban Development, and U.S. Ambassador to the United Nations Human Rights Commission. He is also a best-selling author and a visiting professor at the Liberty University School of Law. Join us this Tuesday, 12 noon, February 17, 2015 for our National Emergency Coalition Conference call. The telephone number is 712-432-0900. As always, thank you for your love of country and your support of STAND. We look forward to your participation on Tuesday's call. "STAND is a non-profit organization that reaches across racial and cultural lines to bring people together around the foundational principles that made America great." Please be advised that the National Emergency Coalition (NEC) is not a formal organization, but a Coalition of individual leaders. It is convened by STAND (Staying True to America's National Destiny). The weekly conference calls held under the NEC banner are primarily for purposes of information and political strategizing on the advancement of certain principles and not the endorsement of or opposition to particular candidates. However, at times there are discussions which involve lobbying, recommendations for political and electoral activity and expressions of support for or opposition to particular elected officials based on their policies. Individual participants have full latitude to lobby on any policy or to endorse or oppose any candidate or elected official. However, nonprofit organizations are circumscribed by the Internal Revenue Code and related rules and regulations regarding activity of organizations tax exempt under IRC Sections 501(C)(3) and (C)(4). NEC is a coalition of individuals only. Listing organizational affiliations on NEC notices is strictly for purposes of identifying individuals and in no way implies - nor does NEC require or accept - the participation of any nonprofit organization in political activity or contributions in violation of any IRS rules. The general rule is that nonprofit organizations may not endorse or oppose candidates and may not engage in a "substantial" amount of lobbying or political activity. Nonprofit organizations should consult with an attorney or accountant for specifics to assure compliance.